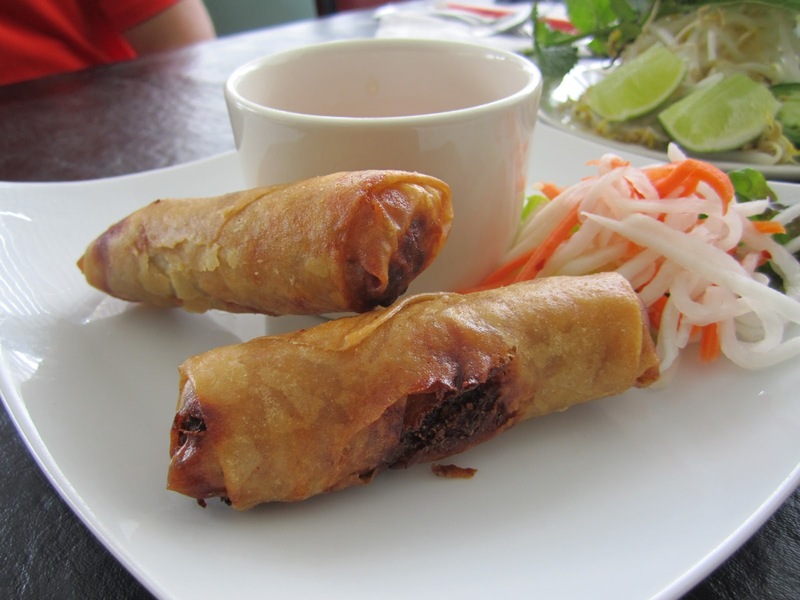 Not quite sure what the portion sizes are, we ordered a plethora of food starting with Mr. T's choice, the Spring Rolls. They also bring a plate of what I presume to be Vietnamese condiments to your table before your food arrives. A plate overflowing with a tower of bean sprouts, lime wedges, jalapenos, and freshly picked basil, and mint. All of these are options to be added into your phỏ if your heart desires. 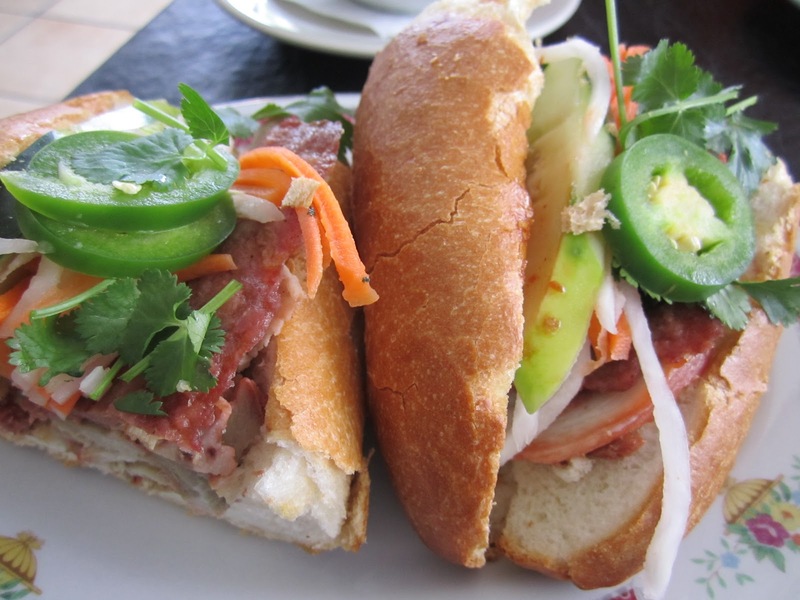 One of my favorite Vietnamese dishes (as pedestrian as it may be) is a Banh Mi. We selected the Combination Pork Sandwich, or Bánh Mì Đặc Biệt. Complete with cucumber, cilantro, pickled carrot and daikon, jalapenos, braised pork, pork sausage, and pork meatballs, this thing is awesome and loaded with flavor. And did I mention the price? $3.99 Yes, you read that right and this was the most expensive bahn mi that they had. 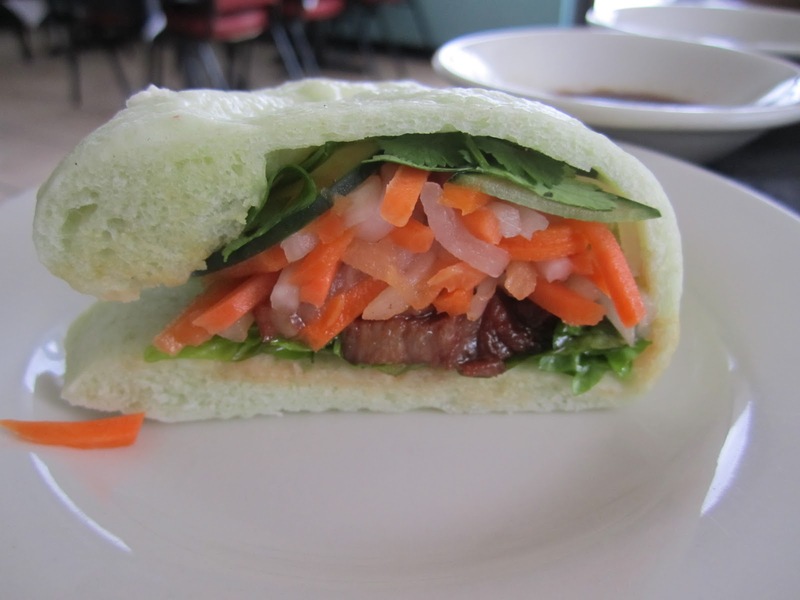 I've never tried phỏ before, but it is well known among Vietnamese cuisine so we decided to try it. Phỏ actually pronounced more like "fa" is a noodle soup usually served with beef or chicken and rice noodles. 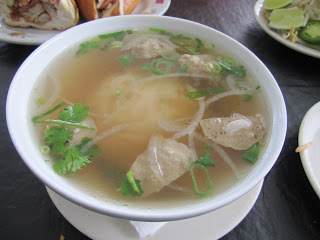 We chose to order the Phỏ Bò Viên or Beef Meatballs Phỏ served in a tasty ginger-beef broth. This is actually half of their portion. Our waiter was nice enough to split everything in half for Mr. T and I since we were sharing. The entire bowl runs you $6.99. Half would have been plenty for my entire lunch, but did we stop there? Of course not. To finish everything off we just had to try the duck bun. I've had pork buns before, but never a duck bun. It was awesome. The duck was sweet and perfectly braised with lots of flavor, a perfect contrast to the tangy and crunchy pickled diakon and carrots that accompanied it. 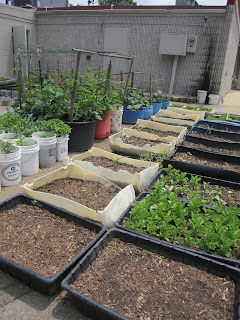 As we left with our bellies stuffed, we walked around the back of the building to see the herbs that the owner has growing in the parking lot. (I read about this in the Edible Upcountry article, and just had to see for myself) I expected just a few clay pots with some puny plants, but oh was I wrong. This man has all the herbs he'll need out there. 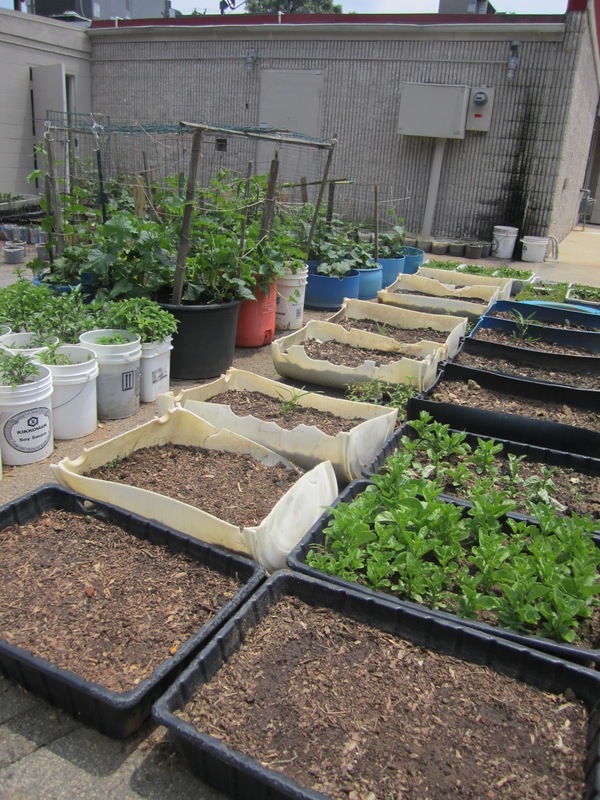 What a smart idea for a restaurant owner, so resourceful and very green. Lunch was a complete success, and I cannot wait to return and try more menu items. For our first time we wanted to try several items. We ended up having way too much food, even though our total for everything was only $18.00. Crazy right? What a fantastic review. 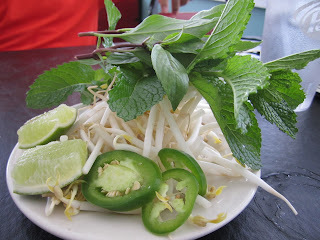 I have never been to a restaurant that serves fresh mint with Pho before, but it sounds wonderful.